While local slam poets raged with microphones and passion on stage last week at the Downtown Library, artist Shantell R. Jackson sat quietly scribbling at a table near the back. Jackson, 37, was planted among several other visual artists participating in a live demonstration as a preview for Fem Fest, Spokane’s second annual feminist festival on April 27. Using her pens and inks, Jackson drew fast and furiously, capturing some of her impressions of the evening. Amplifying positive voices and highlighting affirming messages are themes that run throughout much of Jackson’s lively, hand-lettered and digital works. Prints that read “I once was blind, but I remembered how dope I am” and “You are perfectly you” are such ringing self-endorsements that they seem to hide a darker struggle. Despite her promotions of defiant self-love, it’s not easy for Jackson to be every facet of who she really is all the time. “Sometimes I have to choose,” Jackson said. When pressed to explain, she told the story of visiting Emerge Gallery recently in Coeur d’Alene with her girlfriend. Jackson will be among more than two dozen local artists of color who are participating in this year’s Saturate, a citywide collaboration calling attention to Spokane’s diverse yet under-recognized artists. Saturate was first launched three years ago by Spokane Arts. The program sets aside one month per year to highlight local musicians, writers, performers and creative people of color, and to encourage art lovers to attend the venues that host diverse artists. Jackson is participating in Saturate in several ways. She has a group show at the Saranac Art Gallery as a member of the Portal Collective, a trio of like-minded artists who banded together last year to build an immersive installation at Terrain Gallery. During Saturate, Portal members Jackson, Roin Morigeau and Asia Porter will build on their debut exhibition, “il·lu·mi·na·tion,” to take viewers through a reflective journey using original line and ink work on glass and mirrors. Jackson will also take part in “Shades of Me,” an annual art show created to showcase the artwork of brown women in the region. This year, it will be hosted at the Inland Northwest Women’s Show at the Spokane County Fair and Expo Center on April 6 and 7. Jackson is even in charge of redesigning Spokane Arts’ Saturate logo. The new look is bigger, bolder and more colorful. Jackson raised the letters into the third dimension, as though they’ve been dipped in color, with a printed comic book feel to the colors and textures. “I just tried to saturate the letters with color,” Jackson said. 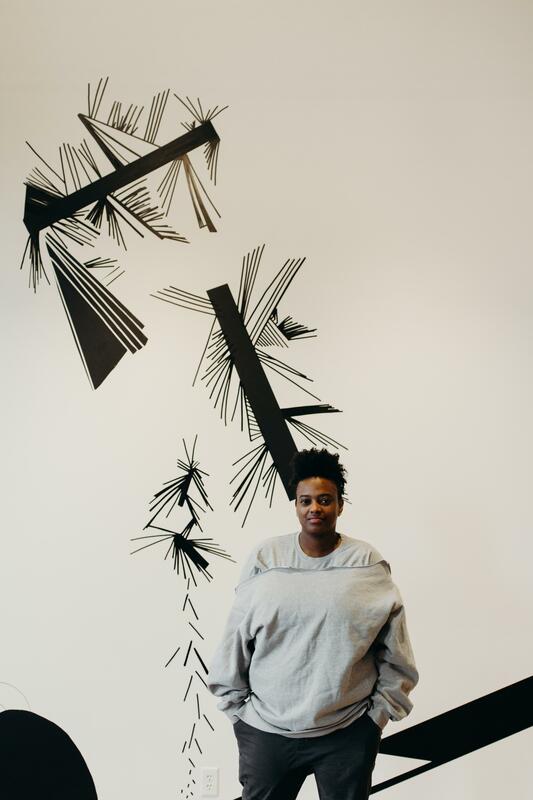 To top off her Saturate tri-fecta, Jackson will have a third exhibition, a solo showing of her prints and drawings at the East Side Spokane Public Library during the month of April. In addition to her hand-lettered messages, Jackson’s abstractions of lines upon lines will dominate that show. From straight and slanted angles, to lines drawn in looped layers like growths on a coral reef, Jackson’s lines are distinct and mesmerizing. Back then Jackson was working at Eastern Washington University as a supervisor of resident hall directors when she headed to the campus bookstore to buy some canvases and acrylic paints. She got into mixed media for a while, antique looks, distressed, steampunk, block printing, digital, and is continuing to build and develop her style. Jackson’s ultimate goal is to do more installations, like the one showing at Saranac this month as part of Saturate. She is still dedicated to her job at EWU, which in recent years has transitioned into a new role as coordinator for academics and multicultural education. Her mission includes encouraging diversity in residential programs at the college. This past fall, she helped create an early orientation opportunity for students of color to allow them to learn about resources on campus and to build community with each other. Saturate has a similar goal, at least in terms of promoting diversity and building connections within a community. Throughout 2018, Spokane Arts hosted monthly meetups for artists of color to network, share resources and exchange ideas, led by local artist and Spokane Arts’ Chase Gallery curator Remelisa Cullitan. In addition to the exhibits, performances and artist talks scheduled during April, Spokane Arts is planning additional events throughout 2019 to create conversations around equity and provide support to emerging artists of color, including professional development workshops, artist talks and more. Published: March 31, 2019, 5 a.m.